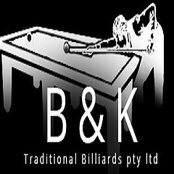 BK Billiards are a family owned business provides Billiard tables, Pool tables and Snooker tables throughout Melbourne and Victoria, Call us on 03 97953888. Professional Information:B.K Billiards is your local pool table specialist! We are family and operated business functioning in Melbourne and surrounding suburbs. Our area of expertise is designing and manufacturing pool, billiard and snooker table. We use the best quality of materials and you can be sure that you are being provided with value for money services! When it comes to our customers we believe in the best and nothing less! Trust us and we promise we will not let you down. Our Products And Service Areas Include: •Pool Tables Melbourne •Pool Table Melbourne •Pool Tables Victoria •Billiard Tables •Billiard Tables Melbourne •Billiards Melbourne •Billiard Table Melbourne •Billiard Tables Victoria •Snooker Tables •Snooker Tables Melbourne •Snooker Table Melbourne •Snooker Tables Victoria If ever you find yourself in any of the above suburbs, you now know whom to call! To book a service or to know more about us you can also visit our website.